These past few weeks of Summer have been busy with lots of trips to the pool, playdates with friends and lots of snow cones!! But we have also had a few life changes as well… my husband just accepted a new job (yay!!) and he also had surgery a week ago. So I apologize for my month off!! But, sometimes life just gets in the way of all of the pretty things I try to share. 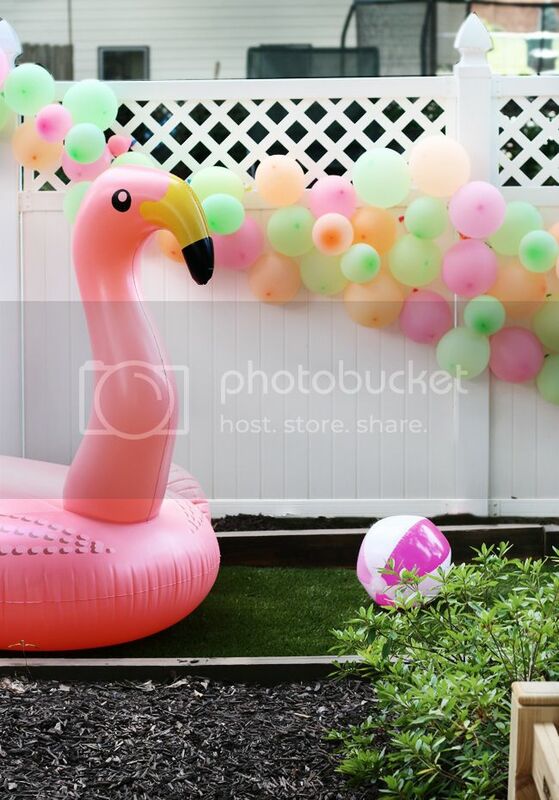 In the midst of his recovery, I was knee deep in pineapples, watermelons & flamingos, oh my! Our little lady just turned six (insert Mom tear here) and we celebrated with a little fun in the sun. 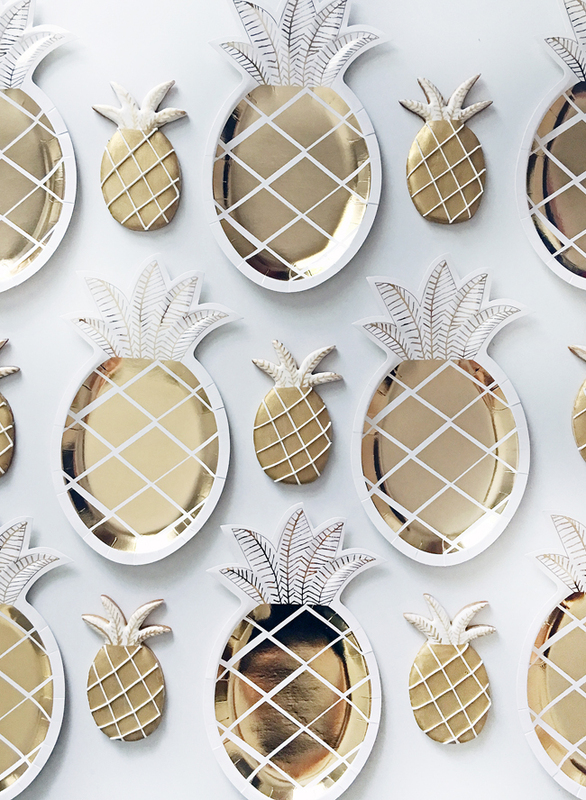 And after finding these adorable gold pineapple plates, we had a jumping off point for the rest of the decor. A goal this Summer has been to use our backyard more… I mean we worked hard enough on it!! So we decked out the entire space for C and her friends. I pulled our old Ikea dining table out of storage, as well as these wrought iron chairs a friend had given us years ago. 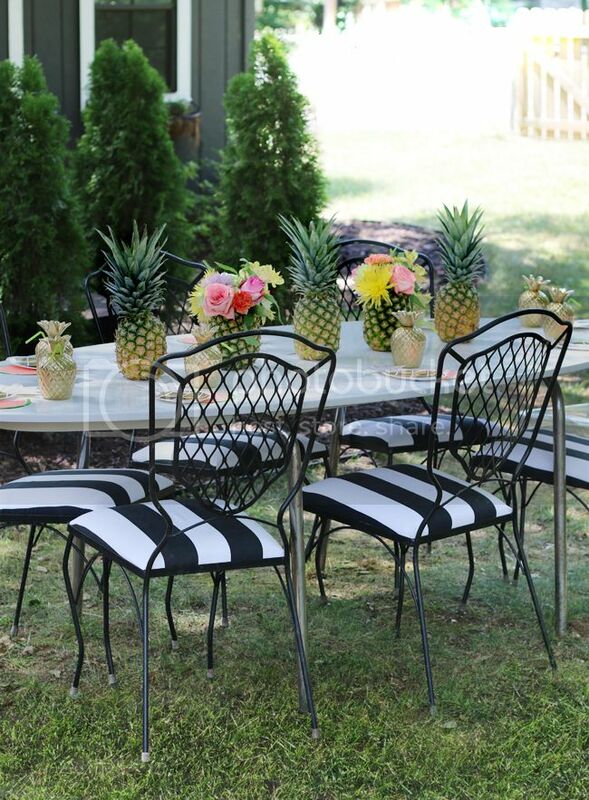 I reupholstered the dated seat covers using some extra cabana stripe fabric I had lying around. There are benefits to being a hoarder… I mean collector. 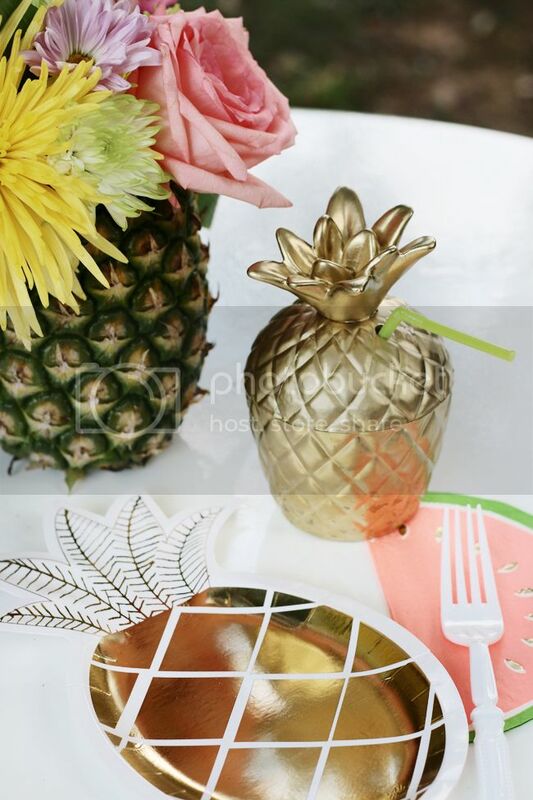 The place settings centered around those glam pineapple plates & super sweet watermelon napkins. I also added some plastic pineapple tumblers for the girls! I love my big girl version so much, that I decided the little girls probably would too… Only plastic vs brass for them. I bought a bunch of plastic yellow & green pineapple tumblers from Party City for about $1 a piece on sale & then at the last minute I decided to tape off the interior of the cup (where the straw goes) and spray painted the cups gold. I loved them before… but I was slightly obsessed with them after! I also happened upon a local pastry chef on Etsy. Her shop is called PS Sweets, and she just so happened to love the gold pineapple plates too!!! She had already created the same version in a cookie!!! 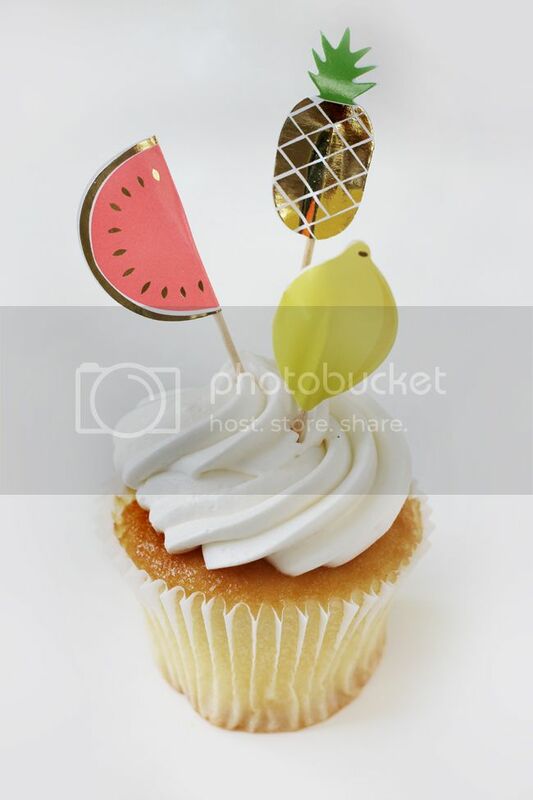 So obviously, I immediately contacted her and the sweet treats arrived just in time for the party. 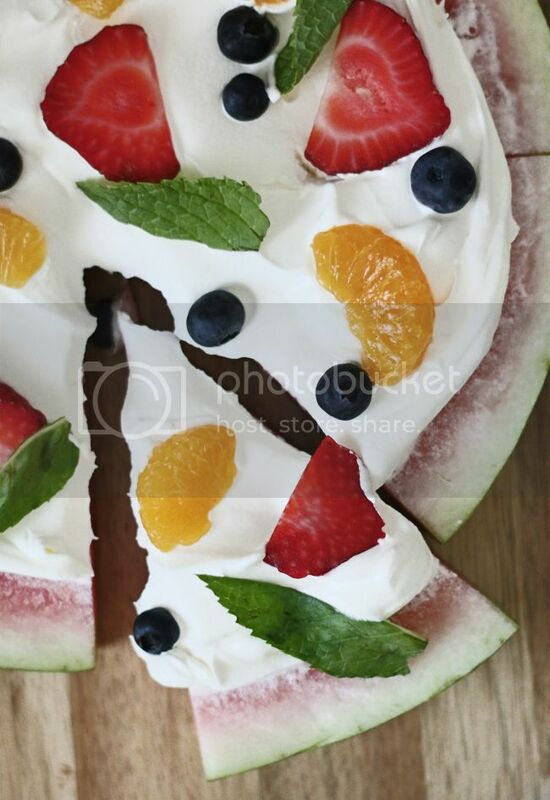 When it came to the menu, we served Watermelon Pizza topped with whipped cream and fresh fruit, Watermelon Salad with Feta Cheese, Lime Juice and Basil & Hawaiian Pizza. Along with tons of other bowls of fresh fruit everywhere. The Signature Beverage (which my child also requested… between my love of entertaining and her father’s career in restaurants and hospitality she has been trained well! Ha!!) We had Strawberry Lemonade made with a delicious strawberry puree. And yes, the grown ups may have spiked theirs with just a little Vodka. Of course we had some Birthday cupcakes, but the main attraction was having a Shaved Ice Food Truck pull up in our yard in the middle of the party. The kids (and grown ups) loved this!! They each got their own cup of shaved ice and were able to pick their own flavors off of taps on the side of the truck. 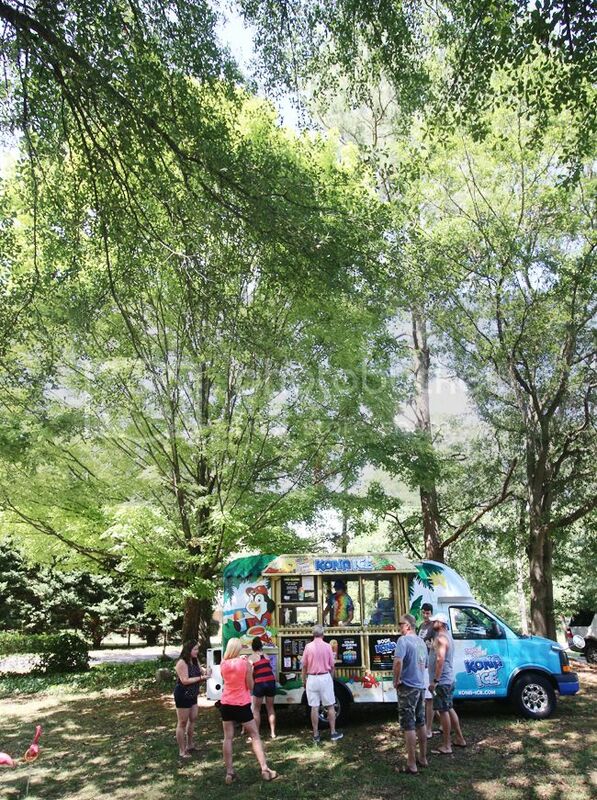 I have a feeling we will be seeing the Kona Ice truck at a few more birthdays this year!! Super impressed! For the activities, I tried to keep them busy! 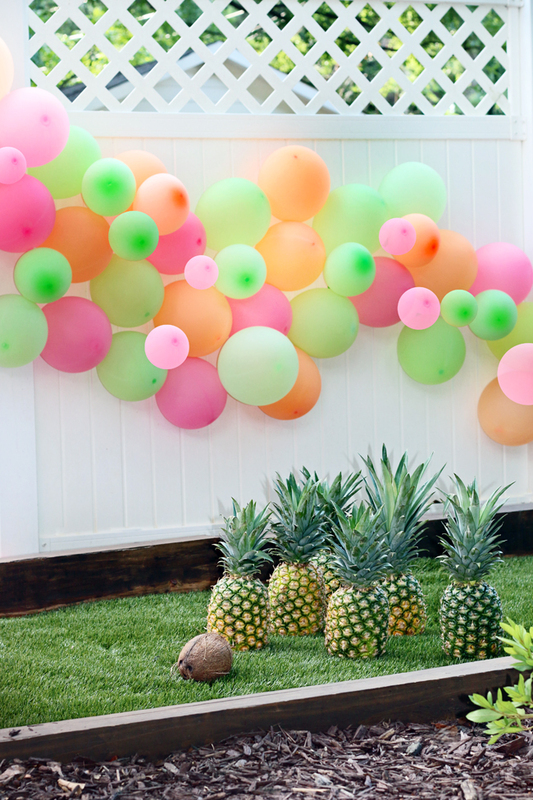 I turned our Bocce Court area into the fun zone decked out with a fun balloon wall with neon balloons & giant flamingo inflatables. They aren’t just for the pool ya know! 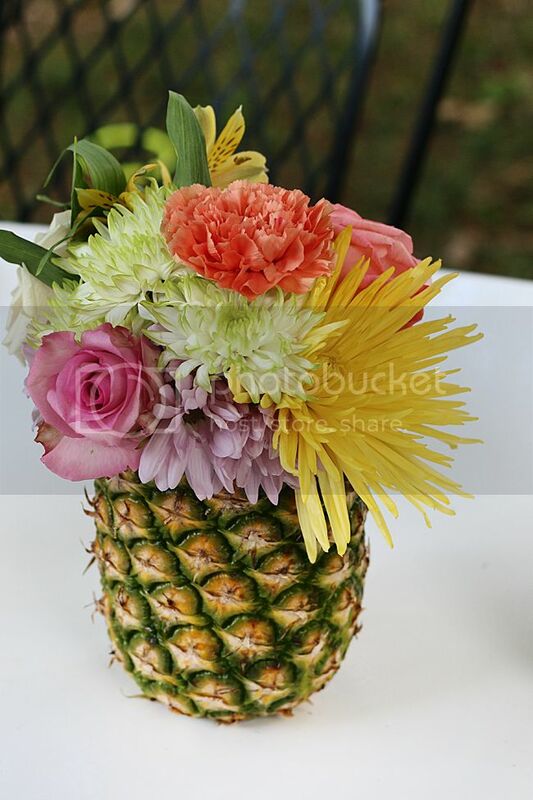 They played pineapple bowling, with pineapples and a real coconut. The girls were fascinated with the real coconut! 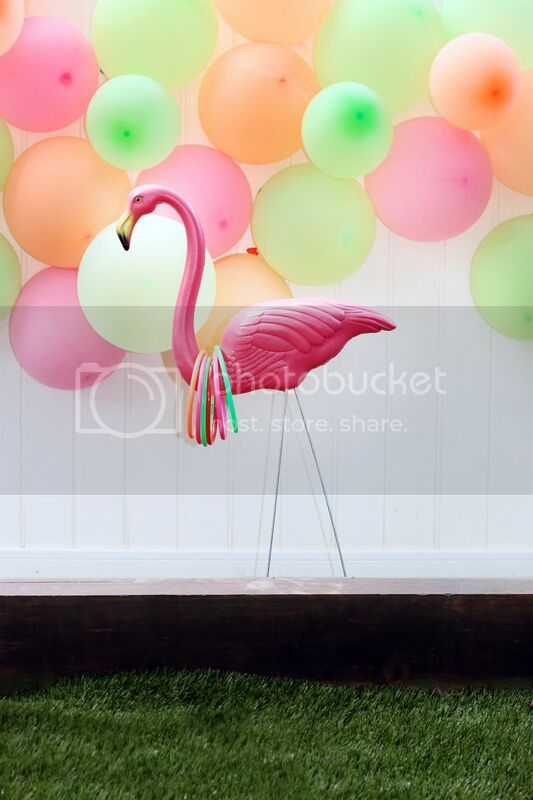 Then we moved onto flamingo ring toss, because it was a natural use of my already existing flamingos! And after creating a fun popsicle craft, they headed over to smash the Piñata I painstakingly created. I’m not gonna lie. It hurt a little bit watching it get whacked over and over again! But they loved diving for these little fruit slice candies, fruit snacks and some fun fruit shaped erasers I found at the dollar section at Target… aka the danger zone. C had such a fun time celebrating with her friends and she loved participating in the planning this year. 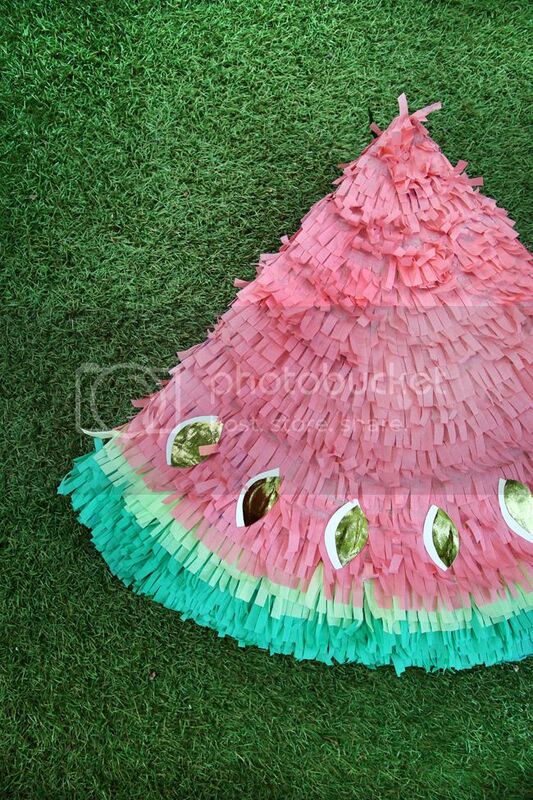 She came up with the idea of the watermelon piñata among other decorative ideas. I hope you all are having a great Summer too!!! 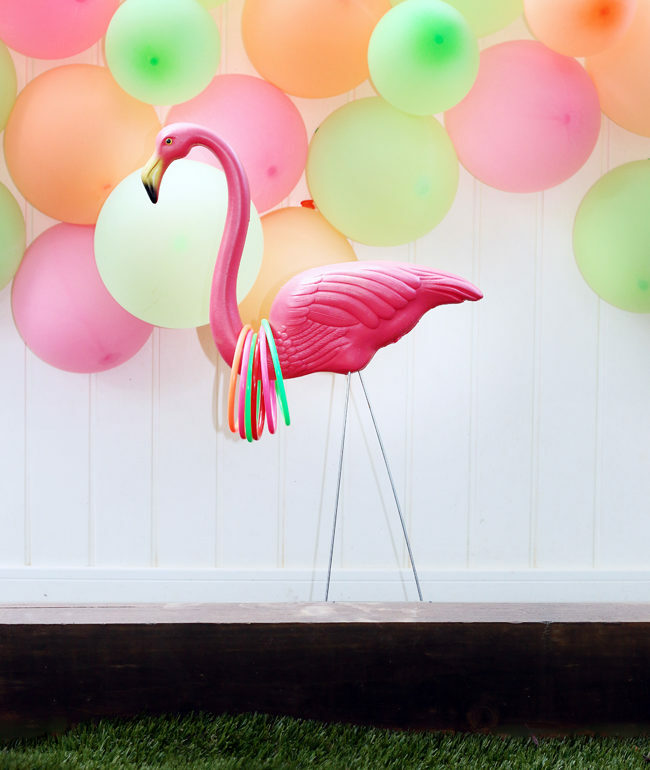 I’ll be back this week to share a little more information about a few of the DIY’s we did for the party.